Quilling requires a lot of patience and dont be disappointed if you dont get it right the first time. For making these quilling leaves, you have to join two strips to get a longer strip and follow a zig-zag pattern like in the photos below. 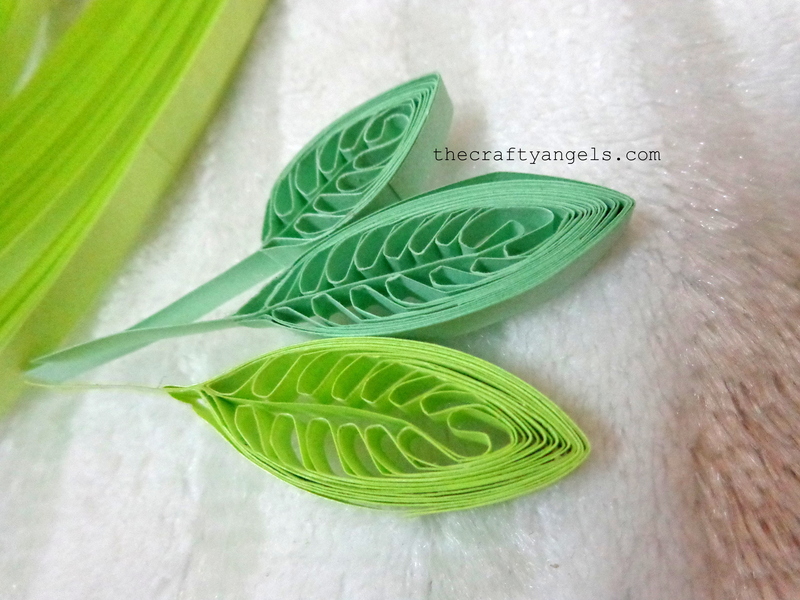 I always try to write down the instructions so that its easy to follow but I guess the photos explain a lot better for this quilling leaves tutorial. Once you select your starting point, insert your quilling strip through the comb (leave a tail long enough to be the leave center vein) and pass it through the next tooth of the comb to left and to right and continue. Check the backside pattern in the above photo I think this will give an idea on how to pull out the quilling strip properly. You can continue the step till the end of your quilling trip and secure it with glue at the back. Pulling out the quilling pattern from the comb will be a little difficult the first time but the key is to slowly pull it out together. Try pushing the quilling paper from the closed ends of the comb to the open ends while holding the center part of the pattern between your thumb and index finger as you pull it out. You will have the pattern intact in your hand and all you have to do now is to bring together the two ends together with the frills towards the inner side. You will have a stupid looking leaf now ( haha!) thats going to turn into a beautiful one! Leave a longer quilling strip tail ( you can always cut if excess) else your leaf might end up with no stem by the time you finish the project. Be carefull while taking out the completed pattern from the comb. Take it out all together else the pattern will have a skewed look that might be difficult to work with. Use a tweezer/holder to hold it after applying glue. Hope you guys enjoyed this tutorial 🙂 It took me so long to come up with this one. Its so easy to just post pictures of my works but the whole idea of me struggling with this blog is to share my knowledge with people like you. Do leave your sweet comments and suggestions in the comments box below and also give a thought on sharing this on the social media so that this tutorial reaches everybody in need of it 🙂 (Check out all my quilling tutorials here ) Will be coming up with a sunflower quilling tutorial soon. Good tutorial! thanks to share! Good tutorial. I am new to quilling. I really like your work. very nice work & tutorial…m new to quilling & this actually inspired me. I´m sorry but I quite didn´t understand it according to photos. Any chance for a video tutorial? Many thanks!